If you want the best bonus when you start betting at Fun88, then you should use the Fun88 referral code. Get up to a £28 Bonus Token (T&Cs Apply). Fun88 Referral Code verified on 18th of April 2019. The first step for new customers joining Fun88 is to follow the new account procedure using the Fun88 Referral Code. As a new customer, you can get up to a £28 Bonus Token for sports betting. For the sports sign-up offer, to qualify, once you have settled all your qualifying bets you have to get in touch with customer support to receive your bonus funds. For the full details, read their Terms & Conditions. Fun88 is one of many relatively new web-based bookmakers now joining the sector. This Fun88 review has been written to advise new and existing players on the best way to navigate the operator’s range of products across different types of gaming. 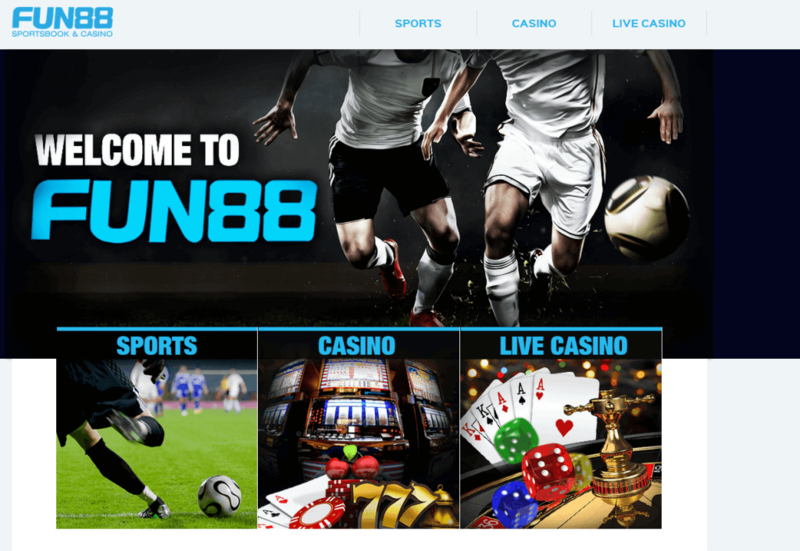 Fun88 is a relatively new sportsbook and casino mainly aimed at the UK and European markets through odds for all the mainstream betting sports in these geographical areas and some that are more obscure. The parent company has several years experience in the sector and is based in the Isle of Man. The government in that jurisdiction promotes the development of e-gaming businesses. Hence, Fun88 takes advantage of an established regulatory environment and many business benefits. The range of sports and markets is standard with all the main betting leagues and sporting events covered on desktop and mobile devices. The site’s owners take a responsible view of problem gambling with a link to GamCare which is an organisation that helps problem gamblers. The company works with this body to raise awareness and identify the signs of problem gambling amongst its customers. There are also verification systems to eliminate as effectively as possible customers who are too young to bet. Remember, you have to be at least 18 to bet in the UK. The site has been designed to highlight the entertainment value of sensible gambling. It features easy to follow sign up and betting procedures. Fun88 UK has set up partnerships with English Premier League football clubs. As of September 2017, Fun88 is the Newcastle United Official Shirt Sponsor. Potential new accounts are prompted with a question: “Not a member yet?” at which point they click on a green shaded box containing the words JOIN in capital letters. You are then taken to a welcome page which requires the input of login details and personal details followed by a declaration of age eligibility and agreement to the company’s terms and conditions. New users must give the answer to a security question when presented with five options that refer to some private personal information. On entering a password, its strength is indicated based on the ease with which it can be guessed and level of security. Most of the new account questions are mandatory and all new customers must enter their email. There are only two currency options namely GB Pounds and Euro. You are not prompted to enter a Referral Code at this stage. Customers can choose not to receive promotional material by email, text or post. Company Name: Welton Holdings Ltd and Fun88 Online Limited. Registered Office: Suite 8/9, West House, West Street, Ramsay, IM8 1AE. Postal Address: Same as above. Model: Online gambling and entertainment. Licenses: Isle of Man Gambling Supervision Commission and UK Gambling Commission. Currency: Pound Sterling and Euro. Restricted countries: Several countries in Asia & Middle East, Caribbean, Europe, North America and Oceania. Services: Sports, live betting, casino, live casino, promotions, help, affiliates, betting rules, results, live results and statistics. Sports is the first option in the horizontal menu on the homepage and the left-hand margin shows the full list of sports offered. The menu is organised with the five most popular betting sports: football, horse racing, golf, tennis and cricket at the top. They are followed by an alphabetical list of 29 more sports, including Specials. The sports covered are generally the mainstream betting sports aimed at the UK and European markets. The most popular events are displayed in a Quick Picks link. It includes the major sporting events taking place in the near future. There is also a link to current live betting events organised by sports. An information bar lists betting rules, results, live results and statistics. The Specials section includes odds for entertainment and politics. A relatively new addition is E-Sports which comprises odds for gaming events by team and individual. The football page displays the markets in two categories: Top Leagues and All Leagues. The first section includes all the major and several non-league and minor leagues in England and odds for the other most popular betting leagues in Europe. The All Leagues section lists leagues in alphabetical order and includes the major leagues in Europe and South America and to a lesser extent Asia and Australia. Leagues can be selected using a tick box and displayed. Fun88 bets include odds for more than 200 football leagues around the world. The English Premier League attracts the most betting interest around the world. There are over 100 markets for each match categorised by All Markets, Main, Goals, Halves, Corners, Period, Specials, Cards and Outrights for the specific league. The date and time for each match are displayed with 1X2 odds in fractional format by default. American and decimal odds can also be displayed by making a selection from a pop-up menu. There is a link to relevant statistics which show recent meetings and current form for each team. The Specials option shows match specific odds and ante post markets related to the Premier League. The racing section includes betting for meetings in the British Isles and Ireland and international fixtures. A race card can be displayed for each meeting showing the details for the horses in the race such as colours, number, draw, trainer and jockey and the previous and current odds. Single, multiple, system and forecast bets are available. The ante post offer includes mainly future races in Great Britain such as the Grand National and the main events at the Cheltenham Festival in March. Golf creates plenty of turnover in the UK especially for the major championships and that is why the sport is so prominent in the Sports menu. The offer is categorised by Top Leagues and All Leagues with the former displaying the current tournaments and the latter providing ante post odds for future tournaments. For each event, you can bet on the outright winner each way and 72 hole matches between two players of similar ability. At statistics, a button takes you to a form guide for each player. In some countries, tennis is the second most popular online betting sport after football. However, UK customers have more interest in racing and golf. The tennis offer includes markets for the ATP and WTA tournaments taking place this week and future events such as the majors and Davis Cup. There are as many as 40 tennis markets for each match in the areas of set betting, games, winner first set, first set total games, first set exact score, winner, games and second set score and totals. The cricket offer focuses mainly on leagues and matches in the UK but there are also odds for future tournaments from around the world. Matches taking place over the next week are featured with a limited number of markets. In all cases, the Win/Loss odds are shown on the screen that highlights match details such as start time and date and the competing teams. The Specials section includes the odds for both teams in a match to win the toss and outright odds for the main events in the UK. Clicking the Live Betting button will take you to a screen on which a horizontal navigation bar displays the options of Pre-Live, Overview, Asian View and Live Schedule. The overview lists the current events available for live betting by sport. The match information and current odds are displayed. For each event, a league is listed with an icon relevant to the sport and a map of the country in which it is taking place. Football is the most popular live betting sport which reflects its overall popularity for gambling and translates into comprehensive betting for football matches from around the world. When a match is selected, details are displayed in a box on the left-hand side of the screen. Each live betting offer displays the current elapsed time and score. When a significant event takes place such as a goal or red card, the market closes but appears again within a few seconds once the odds have been amended. A betting highlights feature previews the most interesting events for live betting over the next few days. The Live Calendar indicates the date, time, sport and fixture for upcoming live betting events for at least the next seven days. A betting slip is permanently displayed in the Sports section. Bets can be placed as singles, combos and systems with all the main combination types of bet covered. The default is to show zero for the number of bets, cost and winnings. When a betting option is selected the bet details are shown on the betting slip with a prompt to specify the stake from a menu from 5 to 500 units of the preferred currency. The number of bets, cost and winnings areas are then populated. At any time you can Clear All and start again or click Place Bets at which point users are asked to confirm their selections and stakes. The bet is then accepted and your account balance is updated to take into account the amount bet. The process is quick, easy to follow and understand, and is very intuitive even for non-experienced gamblers. Even though there is no Fun88 app; Fun88.co.uk can be accessed in a Wap version for mobile phone users. Furthermore, there is a smart version for iOS and Android Smartphone users. The new IM Sportsbook is recommended for iOS and Android Smartphones. The full range of sports and leagues on the desktop version can be accessed using a mobile device. A new Live Casino is pending for the mobile Fun88 site. In selecting the Fun88 Casino option from the top menu on the Home Page you are taken to a screen that displays the casino games available with a name and a relevant graphic. Casino games are categorised as card games, table games, video poker, slots, soft games and instant games. Within each category, the games are displayed alphabetically and in clicking a box you are prompted to play the game or see a demo. The most popular table games online are roulette and blackjack. As a result, users of the Fun88 site are offered several versions of each game. Over 100 slots games are featured including all the mainstream versions of bricks and mortar slots and some of the more obscure. Specific table stakes rules are listed for the poker games on this site including limits and rules associated with placing bets and acquiring chips. There is a live chat, you can click here to access it. 24 hour support but longer response times out of normal business hours and overnight. Response times of between one and ten hours. Complaints are escalated or can be sent to the Isle of Man Gambling Supervision Commission or UK Gambling Commission for UK residents. Lost password procedure by email or online form. Detailed guide to responsible gambling including self-exclusion, limits, underage gambling and parental control. Help guide for deposits and withdrawals. The Fun88 sportsbook offers three methods of making deposits, namely Neteller, Skrill; VISA and Mastercard UK debit and credit cards. Each method offers a fast and reliable secure online process for making a payment. There are no transaction fees and funds are transferred almost immediately. For each method deposits can be made from a minimum of £5 to a maximum of £5,000 and the same amounts in Euro. Deposits via E-Wallets such as Neteller or Skrill do not count for the sports promotion. Withdrawals are made by the original way of depositing funds which limits transactions to just three forms of payment. The withdrawal minimums and maximums are from £5 to £5000 and the same amounts in Euro. Anti-Money Laundering Regulations mean ID documents must be provided before any money can be taken out. Valid documents and proof of address papers are requested and these can be scanned and sent digitally. Fun88 is a UK regulated sportsbook based on the Isle of Man where the government promotes gaming services. Hence, this company enjoys the benefits of local expertise and skills. The sports covered are comprehensive in the context of the UK and continental Europe based customers but limited for any users based further afield. Maybe, one area that could be improved is the payment methods of which there are only three and the same number for withdrawing funds. Since there is no live streaming, the Live Betting offer is quite standard. The casino includes all the most prominent games. Overall, the website is easy to use and the sports, leagues, markets, and games are displayed effectively. There is only an English version and customers can only make deposits and withdrawals in UK pounds or Euro. The customer help department promises prompt replies. Whilst there is no telephone support; customers can write to a postal address and complete an online form if any questions arise. The Rules section covers any sport specific issues and the terms and conditions cover more general potential queries. If you have enjoyed our Fun88 review, you might want to check our Betfair review or our Betfred review. Get your Referral Code for the Fun88 Sports offer!